Entertainment TV Channel / Radio Televisyen Malaysia is a Malaysian public broadcaster. 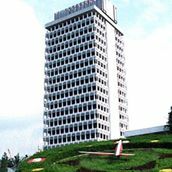 It has 36 radio and three television stations in Malaysia, based in Kuala Lumpur. RTM is the first broadcaster in Malaysia. RTM celebrates its 70th anniversary on 1 April 2016. RTM started broadcasting radio on 1 April 1946, and television on 28 December 1963. The first two radio stations are Radio Malaya (in Malay) and The Blue Network (in English). The transmitters were located first in Singapore and later in Kuala Lumpur (opened in 1950).